Happy Halloween one day late! Kurtis and I had a blast at the ward Halloween party. 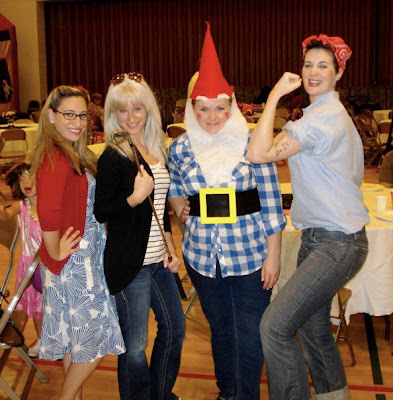 We eat chili and corn bread and baked potatoes, we also hung out with some really cool people. We even saw Elin Woods, Tiger and some garden gnomes. I wish I had more pictures, but I don't. So I just stole this one from Stephanie a.k.a Elin Woods. 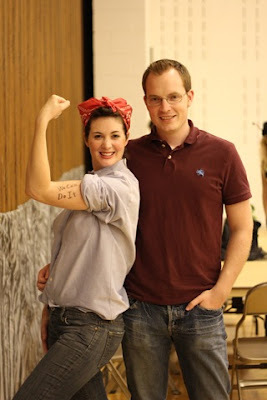 I went as Rosie the Riveter complete with the "We can do it" tattoo on my bicep. Kurtis went as himself. I had to work Halloween night (boo) but it was a celebrity filled night, Adam Sandler ran into my friend Katie with a stroller and some people spotted Kobe Bryant while I was on my break. I always seem to just miss them. He actually did hit her. Katie said she turned to yell at whoever hit her and she said "oh you're Adam Sandler."